SoapEquipment.com: Why Do We Need CoQ10? Why Do We Need CoQ10? In general, CoQ10 is marketed for supporting cardiovascular health but it is actually beneficial throughout the entire body because all of our cells need energy and CoQ10 is vital to the production of energy for our cells. 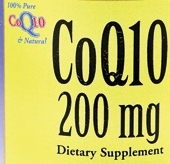 CoQ10 (coenzyme Q10) is an all-natural trans isomer derived from yeast fermentation. Question: "Why take CoQ10" "what part of my health will it help"? Answer: CoQ10 supports cellular health. We need CoQ10 to help us make our energy molecule (Adenosine Tri-Phosphate) to energize all of our cells. CoQ10 also functions as an antioxidant that protects cells from being damaged by unstable oxygen radicals.